Details: Shirt: two toned shirt in beige and brown embrodied around neck, sleeves & collar. 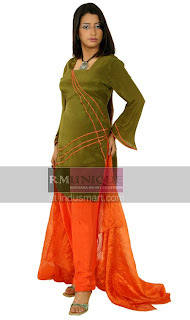 Dupatta: Beige and Green Dyed, green complimenting the Green threads in embroidery. Details: Georgette Chiffon shirt Embroidered using sequins, crystals and coins. Trouser/shalwar: cropped trouser in georgette. Image with shalwar is also provided with the images. Straight trouser or shalwar can be made Select appropriate Options below. Dupatta: gergette dupatta with tossels. Details: Hand block printed outfit in Yellow and white combination, Short block printed in ferozi, white and yellow color florals. Trouser/shalwar: white cotton trouser block printed florals in stripes. Dupatta: In cotton Block Printed. Details: 100% fine cotton outfit in pink hand block printed on full front in Yellow Ferozi and red color florals. Dupatta: Organza Karandi dupatta hand block printed. Details: Shirt in Beige appliqued with brown and embellished with Square marble stones, Beads and Crystals..
Trouser/shalwar: Cropped Trouser in georgette. Straight trouser or shalwar can be made Select appropriate Options below. Details: 100% fine cotton outfit in green hand block printed on full front. Details: 100% fine cotton outfit in Light Blue hand block printed on full front. Dupatta: 100% cotton dupatta hand block printed. Details: Hand Painted on Full front and self Printed Shirt. 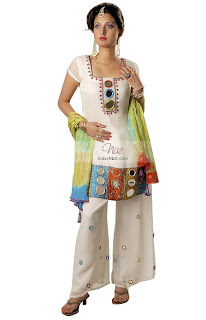 Shalwar/Trouser: Tye & dye Georgette Dupatta: Tye & dye Georgette. Details: High neck shirt hand embroidered using purple, green and white threads with bead and sequins..
Dupatta: 100% cotton Green and purple crushed tye & dye. 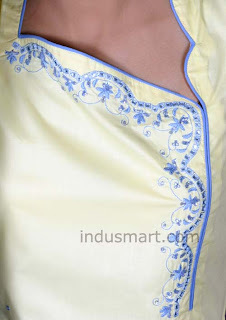 Details: Embroided around and below neck..
Dupatta: 100% Cotton in Blue complimenting embroidery colour.. Details: Shirt Embroided around Neck, on Collar and sleeves. Dupatta/stole: Khaddi cotton Stole with tossels. Details: Pure Katan Silk embroided on full front in three floral motifs using sequins, resham, tilla, naqshi etc. Dupatta: Chiffon crushed banarsi border. Details: Shirt Embroided Around Neck, Sleeves & Daman. Dupatta: Cotton Block Printed & tye And dyed In ice Blue & Parrot Green. Shalwar/Trouser: Plain Ice Blue Cotton. Details: Embroided around full Neck and trouser width. Shalwar/Trouser: Katan Silk. Dupatta: jamavar Stole. Details: Black Shirt Hand embroided using Crystals, beads sequins etc. Details: Hand embroided around neck including back, sleeves, and daman. Shalwar: Patiala shalwar embrodied on bottom. Dupatta: Tye & dye dupatta embroided. 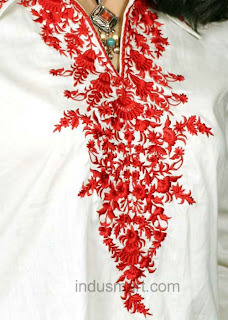 Details: Shirt collar front neckline embroided on collar, below neck and sleeves. 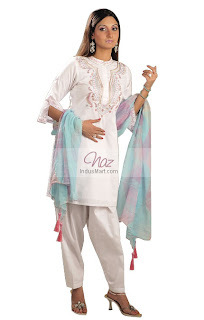 Trouser/Shalwar: Wide leg Trouser embroided (couldbe changed see option below)..
Dupatta: karandi stole in turquoise blue matching the shirt embroidery. Details: Red Crepe Silk blouse hand embroided using sequins, beads, crystals & resham. Sari: in black chiffon georgette embroided around around borders and pallus. Details: 4 Piece strapy poncho outfit embroidered using stones, rehsam, katan, dabka and other zardozi hand embroidery. Poncho: is embroided around neck and borders all sides. Trouser: is of Raw Silk embroidered on one leg on front & Back. Strap shirt: Raw Silk Shirt beaded. Dupatta: China Silk Embroidered on borders. Details: Banarsi Chiffon shirt heavily embroided on full front and sleeve using various tools and material. Trouser: Plain Black Raw Silk Trouser. Dupatta: Yellow and Black Tye & Dye. Details: Strap shirt beautifully embroided using crystal, stones, nakshi and sequin on front. Trouser: Brown crepe silk trouser. Details: 4 Piece Shrug trouser suit embellished using Mukesh chan on shrug and trouser. Plain white Silk Georgette Shirt. Details: Blouse embroided on full front & back using various expensive material like crystals, kundan, stones, dabka, resham and sequins. Sari: borders embroided at 2.5 yards length both sides and both pallus with big motifs. Pouch: is also included in the price. Details: Green shirt embroided in linear lines on full front. 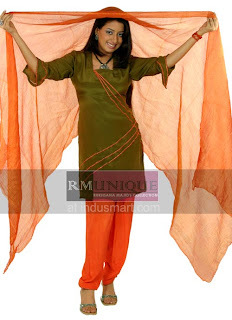 Shalwar: Crepe Silk in Orange. Details: Shirt in brown cottrine georgette embroided using crystal mirrors, resham and zdabka around neck on back zipper and daman (Keera) and sleeves. Dupatta/stole: stole type shawl in beige worked in mukesh. Details: Shirt: Green Raw silk dress, embroided around straps having belt embroided in florals using sequins and beads..
Trouser: Black Raw Silk boot leg trouser embroided around slits and on bottom. Dupatta/Stole: Black chiffon with tossels. Trouser: Boot cut Trouser embroided with waist band front flat and elastic in the back with side zip. Dupatta: Black & Grey tye & Dye crushed. Details: Pure china Silk Shirt full front hand embrided in florals using resham, mooti & sequins. Dupatta: Tye & dye Silk dupatta. Trouser/Shalwar: Pure china silk, hand embroided. Details: Black Poncho top embroided in florals on borders and Mukesh chan all around. Under shirt made of Georgette in Black. Details: Shirt in Chiffon sherwani collar style embroided around neck, Daman, Sleeves using Dabka. Trouser/Shalwar: chiffon in Brown embroided using Dabka & mukesh chan all around Pants. Details: Shirt in Pure Silk georgette embroided using delicate single tar resham work using white and blue threads. 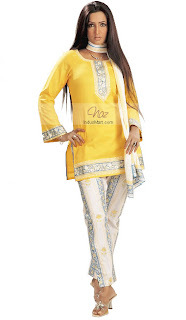 Shalwar: Pure silk georgette shalwar embroided all around gher. Dupatta: Tye & Dye Chiffon Dupatta. Details: 4 piece outfit, shirt in cream chiffon having deep Sherwani collar V Neck machine embrodied using brown threads, same color raw silk camisole machine embroided. Trouser: Brown Raw SIlk machine embrodied. Dupatta/stole: cream & Brown Tye & dye , embroided. Details: Chiffon georgette Shirt floral painted and hand embroided using beads, sequins and zardozi work. 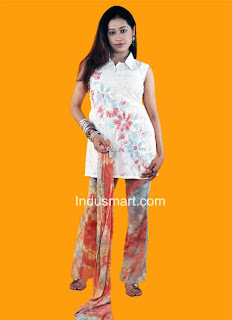 Trouser: in georgette painted with floral and embroided. Dupatta: in chiffon Georgette tye & dye with tossels. Details: Mango Color Poncho Top in chiffon embroided around borders & Neck. 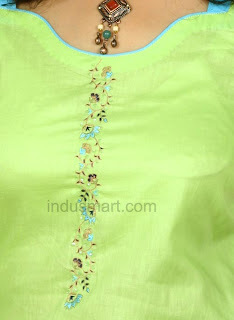 Shirt: in Georgette embroided around sleevs. 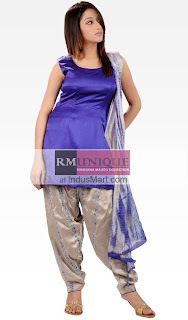 Trouser: In Blue Georgette Embroided. Details: Shirt in pure Raw SIlk hand embroided using crystals, mirrors , tilla , dabka and other zardozi work. Shirt: embroided around neck, sleeves and full chalks/sides. Trouser: in orange Raw Silk hand embroided. Dupatta: Chiffon dupatta embroided on borders using mirrors, naqshi , tilla and dabka. Details: Shirt top Karandi Hand embroided around Neck using dabka, sequin, resham & beads. 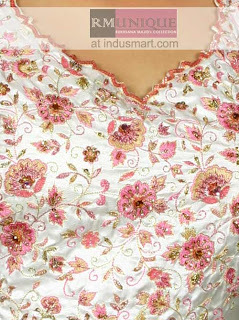 Embroidery chan on full front, sleeves in Pure Banarsi. Dupatta: three tone silk & Banarsi dupatta ghungroos on pallu. Shalwar/Trouser: Pure Katan silk Banarsi Shalwar/trouser. Shameez/Lining: Magenta Color Pure Lady crap Silk. Details: Shirt: in sherwani collar style embroidered around and on neck in elegant combination of colorful threads and patterns..
Dupatta: Chiffon dupatta tye & Dye in four colors complimenting embrodiery. Details: White Karandi shirt Hand embroided using Lime green, Purple,Red and Peach color threads and small sequins used over Lace. Trouser/shalwar: Plain WHite Karandi Shalwar. Dupatta: Pure Chiffon Dupatta Tye & Dye in embroidery threads colors. Details: Pure China Chiffon Shirt elegant and colorful hand embrodiery sing mirrors, sequins, tilla and zardozi work..
Trouser/shalwar: Raw silk trouser embroidered. Dupatta: Banarsi chiffon dupatta tye and dyed in embroidery colors. 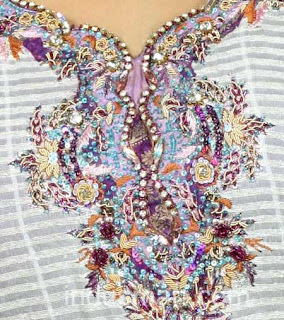 Details: Shirt in chiffon Peacock embrodiery using Threads, beads , sequins and crystal on full front. 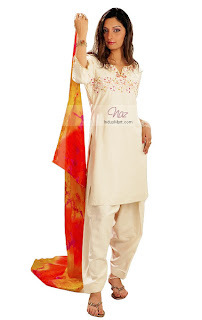 Trouser/shalwar: White Pure Raw Silk shalwar hand embrodiered on bottoms. Dupatta: Pure china chiffon dupatta tye & dye in embrodiery thread colors with whitebase.